Pi Day Post-Mortem — Explosions, Inc.
That filling looks oddly like couscous. 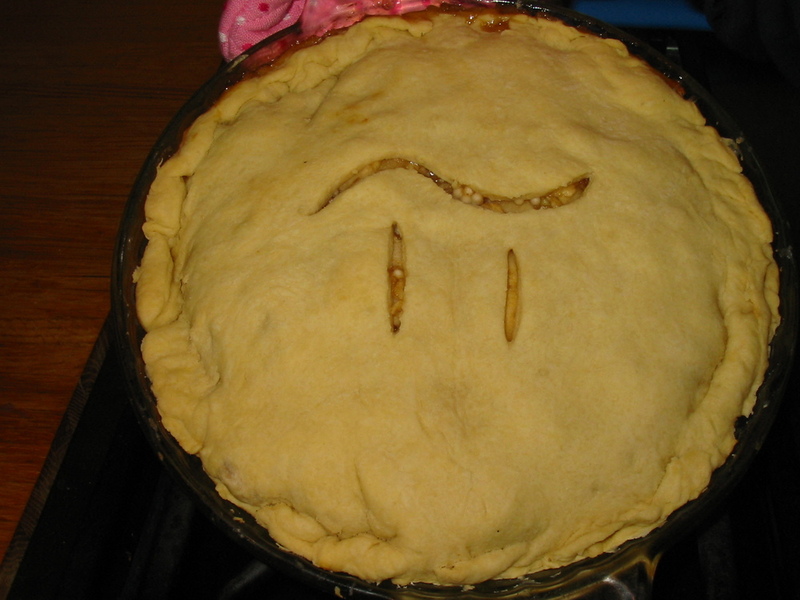 The humble pie is a fitting dessert for Pi Day for reasons other than basic linguistics. As you may remember from high school math class, the number pi is inextricably entwined with circles, the generally preferred shape for a pie. In fact, I think a pie almost has to be circular by definition. I'm sure there's some weirdo out there who has tried square pies, and if there is justice in this universe they tasted terrible. I'm even willing to put money down that there's a hipster somewhere in America who baked a square pi pie on Pi Day for the irony of it all (and it was probably fair trade and gluten free). Shame on you, square pi pie makers, not only for desecrating that which should be properly circular but for removing the mathematical association between the pie and the pi. See, pi is the mathematical relationship between a circle's circumference (how big it is around) and its diameter (its length across when you draw a line through the middle). Specifically, pi is the ratio of the circumference to the diameter, or the number that you get when divide the circumference of any circle by its own diameter. π = C/d, and from here we can use some basic algebra to derive the formula for the circumference of a circle. Multiply both sides by d and you get another equation that hopefully looks familiar from geometry class: C = πd, or the circumference is equal to pi multiplied by the diameter. Try recreating this nifty animation with your square pi pie, hipster kid. Pi is a mathematical constant, which means its value is the same no matter what circle you're using. If the shape you're trying to measure is a circle, then pi is your number, no matter how big or small. This makes basic intuitive sense, I think, since all circles are exactly the same shape, so the relationship between their respective circumferences and diameters will always be the same. Just because it's always the same, though, doesn't mean it's a simple, cut and dry number. No, pi is part of the set of irrational numbers. This doesn't mean that pi makes bad arguments or that it's always flying into an emotional rage; in math, the definition of "irrational" is that a number can neither be represented as a ratio of integers nor as a repeating decimal. In more colloquial language, that means that there are no two numbers that you can divide by each other that will equal exactly pi (except π/1 if you're being a smart-aleck) and that the numbers after the decimal point will go on forever and never repeat themselves. Computers have calculated pi to over ten trillion places and you can read the first million digits at the official Pi Day website if you are so inclined. These days we know that pi is irrational because mathematicians have constructed multiple proofs of its irrationality. We don't have to continue computing it into the quadrillions with more and more sophisticated computers while hoping that it won't eventually start repeating itself. No matter how far we calculate it, though (and that won't stop any time soon because people love setting records) we will never know its exact value because it continues infinitely. We can just find more and more precise approximations. Back in ancient times, though, when mathematicians first started working with pi, they didn't have even algebra or calculus much less sophisticated computing equipment. When they wanted to figure out the ratio of a circle's circumference to its diameter they had to do it the old-fashioned way: straight-up measuring it. Computers may only give an increasingly accurate approximation of pi but at least they know they're working on the right number. Imagine trying to figure it out accurately when all you have is a string to measure the circumference and then compare it to the diameter! This led to wildly varying values for pi throughout antiquity. Eventually some more precision emerged when Archimedes used regular polygons, placed inside a circle, to measure the circumference more accurately than manual measurement techniques ever could. It wasn't until the infinite series method, a purely mathematic computation, was invented in the 16th century that we really began to stretch our understanding of pi. Now, pi has fascinated cultures the world over for millennia because it's so integral to our understanding of a shape that shows up constantly in our lives: the circle. A circle is simple: make a point, draw a line segment out from the point, and then sweep the line segment all the way around until it gets back to where it started. You've just created a circle. No three line segments, three angles like a triangle, just a single point and a single line segment. Circles and spheres, their 3D counterparts, abound in nature: eyeballs, planets, stars, certain fruits and seeds, all of these are roughly circular. So, then, why did all of these cultures have such a hard time measuring pi accurately? Why did we have to wait until someone came up with a purely mathematical method? The answers lie in that word "roughly" up above. A circle may be simple but that doesn't mean it's easy. Any circle or sphere in nature is only roughly circular. Any circle you can draw with your own two hands, or even if you have a compass, is going to be imperfect. The perfect circle is a mathematical construct: perfectly round, perfectly useful in geometry, but perfectly unattainable in the real world. Before you even start to measure your circle you're doomed to be just a little bit off in your calculation of pi because your circle will never be perfect. The ancient Greek philosopher Plato, working centuries before Archimedes began to whittle away at pi, posited that there were really two worlds: the material world we live in, and the world of the Forms, where one could find perfection in all things. It was only in the world of the Forms that one could find a Perfect Circle, Perfect Colors, or even Perfect Justice or Goodness. Objects in the material world obtained their characteristics by "participating," however imperfectly, in the Forms; a circle we draw gets its circularity from the Perfect Circle in the world of the Forms, the Platonic Form of Circle, but it can't do it perfectly since it exists in our material world. Almost immediately after Plato died his student Aristotle started dismantling the Theory of the Forms, pointing out that it seemed more likely that what made a leaf green wasn't some Perfect Green in another world but rather something inherent to the leaf itself. And besides that, where do you draw the line? Is Perfect Dirt somewhere out there? What about Perfect Mud, or is mud just an imperfect version of Dirt? Or is it an imperfect version of Water? Or is it a mixture? And what about negative things? Is there a Form for Perfect Evil or one for Perfect Disease? Aristotle respected his teacher but he had his own ideas. Needless to say, there were plenty of issues with the idea of the Forms, not the least of which is that there can be no direct evidence that it exists and there are simpler alternative explanations for things like the circleness of circles, the greenness of green, and the dirtness of dirt. These days only a few stubborn and foolhardy Neoplatonic philosophers still cling to that way of thinking while the rest of the world recognizes that the Perfect Circle is a mathematical abstraction, not a concrete thing in this or any other world. Using the power of pure mathematics we can learn all sorts of things about this abstract entity and then apply them to the concrete, imperfectly circular objects in our everyday lives. Like, for example, cookies, pop cans, basketballs, and the planet Earth. And, most importantly for Pi Day, by making pie dishes the proper shape, even if they're never going to be exactly perfect. And you know what? That's okay. The pie will still taste great. Well, unless you cooked it wrong, and that's a different topic for a different day.